Please help support our free Bible MP3 downloads! 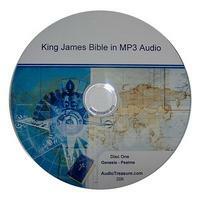 The AudioTreasure site exist to offer audio Bible files for download in as many languages as legally possible. This site serves over 1 million Bible mp3 file downloads per month to 200 nations around the world. The AudioTreasure site is user funded and receives no outside support. Sales from our online store help us continue to pay the growing bandwidth and server cost. Please consider blessing this effort by visiting the store and purchasing an audio Bible for yourself or a loved one. Your purchase allows us to keep offering audio Bible downloads to people in restricted access nations and to university students around the world who access the site with school computers. Thank you for your support of audio Bible downloads! The entire World English Bible in mp3 audio is just $15.75 on a USB thumb drive and the files can be legally copied to give to others. Your own local copy of an audio Bible is great for those times and places where the internet is not available. .
Our MP3 Bible files can be played on your computer,tablet,smartphone,gaming console and most DVD players. Questions, comments, complaints and prayer request.